Vision-related tasks in animals are accomplished in an extraordinary range of ways. There are at least ten basic eye structures, each of which can be adapted along dimensions such as colour perception, field-of-view, photoreceptor density, field of focus and so on. Examining what an animal's eyes seem to be optimised for can lead to insights about the resource, threat and physical environment they face. Apex predators have forward-facing eyes, while prey animals tend to have eyes either side of their heads to maximise field of vision. Horizon-scanning animals such as lions and horses have a horizontal visual 'streak' of high photoreceptor density, while birds and tree-dwelling animals, including primates, tend to have a broadly circular central 'fovea' where visual acuity is highest. Colour perception tends to be much more discriminatory among land animals than in those living in the sea, where the chromatic spectrum is significantly narrower due to absorption by water. In humans, the make-up of our foveal and peripheral vision systems are quite distinct, suggesting that they are optimised to different tasks. 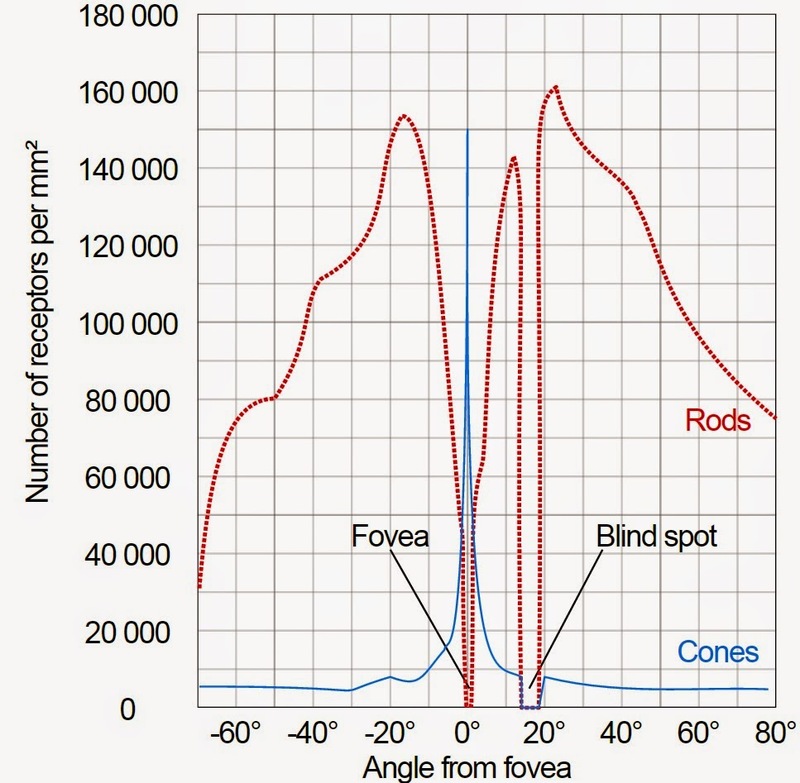 Foveal vision is extremely narrow, very high-resolution, and dominated by colour-sensitive 'cone' cells that require high levels of light to function. In contrast, peripheral vision is accomplished with 'rod' cells that respond well in low light levels but lack colour discrimination. However, we are usually unaware of quite how narrow the angle of our high-acuity vision is. Only when we experience visual disturbances such as scintillating scotoma do we realise how difficult it is to perceive detail (e.g. for reading) outside of this tiny 'spotlight'. Most of our perception of the world is in any case the result of visual processing - thought to account for around a quarter of the brain's structure - and so our conscious acquaintance with the information our eyes are receiving is somewhat indirect. But we are primarily unaware of the fovea's narrowness, of course, because our head and eyes are highly mobile. Wherever we look, we see a detailed picture, and by-and-large the things we want to look at only rarely move faster than our eyes can catch. A foveal level of vision everywhere would be unnecessary as well as sacrificing perception in low light. Instead of giving us high detail everywhere, human vision represents an efficient partnership between a small, mobile, highly-detailed foveal component, and a wide, low-resolution peripheral component. Peripheral vision's vital role is to identify objects of possible interest in order to cue examination by the fovea. Without peripheral vision to support it, the fovea would be completely debilitated, as the experience of tunnel vision sufferers attests. Many organisations with analytical components have re-invented this division of responsibility, which aligns broadly to a distinction between hypothesis-generating and hypothesis-testing analytical tasks. Organisational peripheral vision involves identifying novel threats and opportunities, seeking new markets, and identifying new products and productive technology. Organisational foveal vision involves gathering data on known threats and opportunities, analysing existing markets, and exploiting existing products and technology. Often, but not always, these tasks are conducted by different parts of the organisation. The importance of peripheral vision is easy to underestimate though. By necessity, it does its job out of the spotlight. When analytical budgets get cut, it can look more attractive to cut horizon-scanning, threat-driven functions than to cut those functions dedicated to exploiting known profit drivers. But organisational tunnel vision carries existential risks for many organisations. Failure to spot emerging threats has arguably been a significant driver behind a host of disastrous business decisions, including General Motors' failure to adapt to the growing market for smaller cars, Blockbuster failing to acquire Netflix, Kodak's tardiness in promoting digital products, and Excite's refusal to buy Google in 1999. The consequences for warning failure in defence and security can of course be more significant. A focus on known threats at the expense of novel ones may have lain behind failures adequately to anticipate and respond to developments such as the stationing of Soviet ICBMs in Cuba, the Iranian Revolution, or the September 11 attacks. Although our everyday perceptual experience may relegate it to a supporting role, peripheral vision is essential for our survival, as an animal or an organisation.